Update 7/2: We’re happy to announce that the normalization and close variant changes have ramped for our English markets (US, UK, CA, and AUS). Please make sure to review the changes and recommendations below to ensure you are maximizing your volume. Update 5/21: In order to ensure a smooth transition, we’ll be ramping the normalization and close variant changes on small amounts of traffic over the next few weeks to better assess the impact. We also want to give you more time to add any stop words and special characters to your accounts to prepare for this change. As for the negative keywords section, based on feedback from you, we’ll revisit the functionality and work on a solution that more effectively avoids at the source. Understanding a searcher’s intent based on their search query is never a perfect science. Adding stop words, characters, symbols, etc... to a keyword or query can add ambiguity to the definition and the intent. Most of the time, the addition of these stop words, characters or symbols deliver the same intent. For example, a user searching on the term “buy a car” vs. “buy car” have the same intent and interact with ads similarly. However, in a few select instances these keywords may deliver different intent. 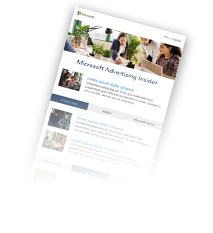 For example, a user searching on the term “the office” vs. “office” could be looking for different things (The TV show vs. Microsoft Office) and thus could engage with an ad differently based on their particular intent. Today in Bing Ads, we treat these terms as one through a process called normalization – the process by which extraneous characters, such as punctuation marks, special characters and stop words are removed from keywords in Bing Ads campaigns and then dynamically handled when ads are served against user queries in the auction. While normalizing keywords provides you a better way to scale your keyword lists, we have received feedback that for some highly specific keywords this approach limits precision and control. That’s why starting May 21st we are making improvements in our matching technology. You may recall our blog post last spring announcing relaxed constraints for uploading keywords containing stop words and characters. This relaxed constraint was in preparation for upcoming changes in our normalization process. Starting in late May, we will begin incorporating this enhanced normalization logic into our auction process. A description of the changes can be found in the table below along with examples of how raw user queries are normalized today on Bing Ads, and what the query will look like after the normalization change. As we transition to this new normalization process, we encourage you to review your keyword list and add any relevant characters or words into your account to ensure you maximize traffic from your ads. Moving forward to show on queries containing stop words you will need to bid on them directly in Bing Ads. A great way to learn what words to add is to opt into broad match and review search query term reports to understand what users are searching for. In addition to the normalization changes, we will be removing the opt-out functionality for close variants starting May 21st. Advertisers today are already automatically opted into close variants, so most of you will see little to no impact. Close variants help drive highly qualified and relevant click volume to your campaigns by maximizing your presence on queries that are the most relevant to your products and services. Since testing close variants last August, on average we’ve seen ~2-3% growth in click volume while retaining existing ROI for advertisers. With close variants, advertisers can scale their keywords without spending time building keyword lists of plurals, misspellings and other close variants that have similar intent. For those who are concerned about matching to some of these variants, you can leverage negative keywords to help control your traffic and costs. The search query term report is great way to see what queries your keywords are matching to, how they perform and what negative keywords you may want to consider adding to your account. Additionally, Bing Ads prefers to match queries to keywords that are identical so you can still add your own close variants, and adjust the bids based on performance, which becomes even more valuable with the enhanced normalization logic. To prepare your campaigns for the upcoming changes, we encourage you to review your keyword lists and search query reports and add new keywords that will no longer be normalized. To maximize your click volume, consider opting into broad match if you haven’t already. Additionally, you can leverage search query reports to consider any negative keywords you may want to add. We often hear our customers asking for more efficiency and more volume from us and we believe these changes will help you better manage campaigns and achieve better performance. UPDATE: With the 5/21 release date, we will be launching these changes to all major English speaking markets across all devices (US, AUS, UK, and CA_EN), while we take the next 12 months to ramp globally.